After weeks of highly graphic murders committed by ISIS against American and British citizens, another Islamic caliphate group has threatened to punish the French for their bombing campaign against the Islamic State in Iraq, in a video featuring a tourist kidnapped on Sunday. Herve Pierre Gourdel, 55, who was pictured squatting on the ground flanked by hooded guards wielding Kalashnikov rifles, spoke to confirm his name and home town of Nice in southern France. A professional mountain guide, he was reportedly captured by Jund al-Khilifa (Soldiers of the Caliphate) in Algeria on Sunday while out walking with friends. He had been in the country for just 24 hours. 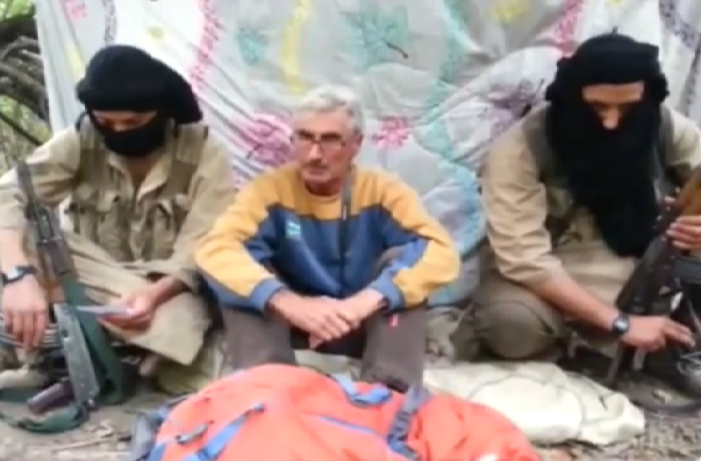 One of his captors said in the video, released last night: “It is up to Hollande, president of the criminal French state, to halt the attacks on the Islamic State within 24 hours of this statement, otherwise his national Herve Gourdel will have his throat slit”. France launched its first airstrikes against the Islamic State on Friday as part of an American led coalition force from designed to crush ISIS. More than 50 nations are involved in the coalition including the UK, Australia, France, Canada, Germany, Jordan, Turkey and Saudi Arabia, although so far France is the only country other than the US to have enacted airstrikes in the region. Australian forces are expected to do so soon, after Australian police foiled a plot to behead Australian citizens on the streets of Sydney and Brisbane. However, the threat of coalition action has prompted ISIS’s chief spokesman to take to the airwaves on Saturday to deliver the following order to devotees of the Islamic State: “If you can kill a disbelieving American or European – especially the spiteful and filthy French – or an Australian, or a Canadian, or any other disbeliever from the disbelievers waging war, including the citizens of the countries that entered into a coalition against the Islamic State, then rely upon Allah, and kill him in any manner or way, however it may be. “Smash his head with a rock, or slaughter him with a knife, or run him over with your car, or throw him down from a high place, or choke him, or poison him”. “The threats made by this group are extremely grave and demonstrate the extreme cruelty of (the IS group) and all those associated with it,” French Foreign Minister Laurent Fabius said. That this French citizen was kidnapped to order in Algeria, which is some 3,500km away from ISIS’s centre of power in reaction to a specific order made only hours before is indicative of the power commanded by the Islamic State over Jihadists worldwide. Similar attacks have already been foiled in Belgium and Australia by security services, but more may be in planning in response to the ISIS diktat. Despite the capture and threatened murder of a native French citizen, his government has declared that it won’t negotiate for his relief, airstrikes against Iraq continue and coalition bombing has extended to ISIS positions in Syria today. The French Prime Minister told radio there would be “no discussion, no negotiation and we will never give in to blackmail. Even if we are of course very worried after the authentication of this video”, reports theLocal.fr. Presuming the Algerian Caliphate group intend to follow through with their threat and the French government doesn’t give in to their demands, Gourdel unfortunately has less than 12 hours until the deadline is met.